Burning In Hell is a new power/speed metal band on the scene, hailing from Brazil. The band lists their influences as Gamma Ray, Hammerfall, Iron Maiden, Blind Guardian, and Helloween. As you may have guessed, the guys aren't really bringing anything new to the power metal scene. However, this debut album demonstrates that Burning In Hell is a band with promise, and not simply another cookie cutter band that should be easily dismissed. 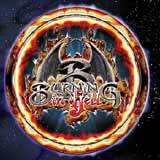 Throughout the album, Burning In Hell seems to have a blueprint for their songs from which they deviate very little. The guitar work is tight and intricate, but the speedy riffing and the drum beats sound way too similar throughout most of the album. Structurally speaking, imagine a typical Iron Savior or Blind Guardian drum beat accompanied by a tight and crunchy riff. While that may sound enticing, you need to add some variation and other ingredients in order to maintain a listener's interest of the course of an entire album. It almost sounds as if the guys are playing it safe here, sticking with conventional power metal ingredients, and not taking enough of a chance to develop their own sound and identity. Having said that, I implore you to stick with this album until the very end. This album certainly improves as the album progresses, with the songs taking on their own personality during the later stages of the album. I must also grant the band this much, they play their instruments very well. For example, the solos give the guitarist an opportunity to show off his technical skills and add some of his personality to the songs. The drummer keeps perfect time and has no trouble whatsoever giving each of the songs on this album a thunderous speed metal backbone. I really enjoy the lead vocals of Leandro Moreira. He reminds me of an up and coming Thomas Rettke (Heavens Gate). Leandro's voice is very melodic, and he adds some much needed emotion to the songs. Some melodies throughout the album are stronger than others, but I can't honestly say that any of them stay with me after the album is finished. Again, I get the feeling that the guys were a bit too conservative in this aspect of the songwriting. There are three particular songs on this album that show some interesting ideas that I hope the band expands on in the future. Forever I'll Be There, Shedding Bloody Tears, and Welcome to the Battle contain some of the best melodies of the album. Furthermore, I enjoy the earthy, Jag Panzer like harmony vocals that the band uses in these songs; it helps to give the songs an identifiable quality that is lacking in many parts of the album. Shedding Bloody Tears clocks in at just over eight minutes. The band makes the most of this opportunity to explore some creative songwriting. The songs starts off quietly, but builds into a thunderous battle hymn. Toward the end of the song, the music tapers down to a soft, snare drum backed vocal piece, only end with a quick burst of energy. This is the type of creativity that I hope the band explores in their future work. Burning In Hell have set themselves up on solid ground with this release. They have a great vocalist and equally talented musicians all the way around. The biggest fault I find with this album is sticking too close to a predictable blueprint throughout most of the album. Musically speaking, the guys have the talent to produce something really big. With some growth and extra effort put into the songwriting department, I think the next Burning In Hell album could be very interesting. Although this debut album contains too many "heard it before" moments, there are some interesting ideas here as well.